If you’re like our family, your kids won’t need all the Halloween candy they’ll receive. You also won’t need the leftovers you have from buying more candy than you’ll be able to pass out. A great use of that Halloween candy is to remind our troops that they’re not forgotten! You can thank our troops, make someone’s day, share your candy and even get a tax deduction. You only need to bring your candy to your local drop off location. There are three great organizations collecting candy. Operation Gratitude, which has sent over 1.6 million care packages to troops, wants our extra Halloween candy to create care packages for our troops. Soldiers’ Angels, which has sent over 800K care packages to troops is also collecting candy for care packages. And, lastly, the Halloween Candy Buy Back will collect your candy and pay you $1 for every pound you donate. They’re also sending your candy to troops. Donate leftover candy (but please don’t include pixy stix or powdery candy – they don’t ship well). Here are three places that will accept your candy. You can find a Soldiers’ Angels drop off near you. Soldiers’ Angels distribute the candy to deployed troops, veterans, and wounded veterans in VA Hospitals. The Halloween Candy Buy Back program has dental offices across the country that will buy your candy for $1 a pound and send the candy and tooth brushes to troops. The distribution started with a single dentist looking to help our troops and is now accessible across the US. Their partners, Move America Forward, and Operation Shoebox, are nonprofits that provides care packages to troops. Find an Operation Gratitude drop off location near you. You’ll need to enlarge the map by clicking the frame icon in the top right of the map. Then you need to click the magnifying glass to search by zip code. (Not that you need an incentive, but if you find dentists on the list of your local drop offs, the dental office will sometimes pay a “buyback” fee for the candy and provide a toy for your kids.) 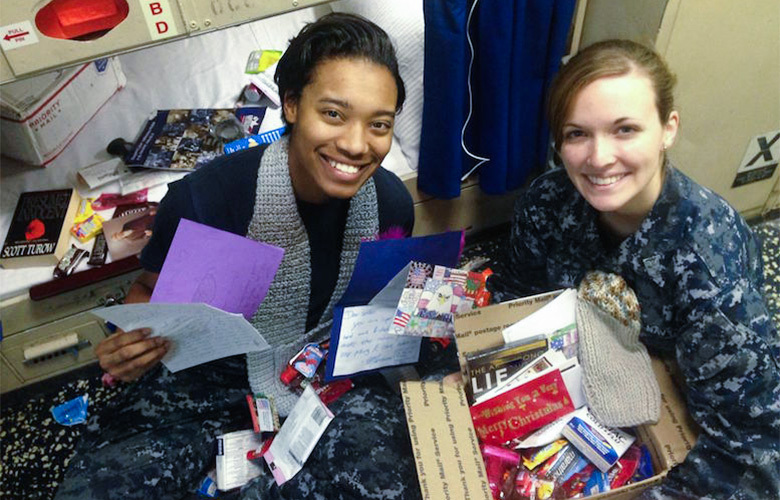 Operation Gratitude distributes the candy along with care packages to deployed troops and first responders. Operation Gratitude was having some map problems, but hopefully that will be fixed soon, making it easier to find a local drop-off. If you’re dropping off candy with Operation Gratitude,Write letters and draw pictures that can go with the candy in care packages. Also donate any of the many other items troops need and want. Check out the Operation Gratitude Wish List. Operation Gratitude and Halloween Candy Buy Back locations are shipping candy by November 15, so the sooner you can drop off your candy the better. You can even take a deduction for the value of your candy on your taxes. If you’d like to ship the candy yourself (or there isn’t a convenient drop off center), Operation Gratitude has shipping guidelines here. What a nice way to say, “Thank You Veterans” and to support our troops. Want more positivity in your Facebook news feed? Then like our Facebook page. You’ll get inspirational stories, good news and a focus on the positive. (About one post a week.) Thanks! Here’s another Halloween Act of Kindness. This one with a teal pumpkin. Here are 103 Random Acts of Kindness that will make you an everyday hero. 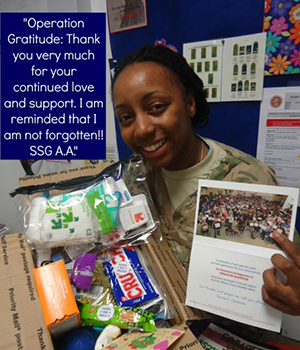 “Operation Gratitude: Thank you very much for your continued love and support. I am reminded that I am not forgotten! !” – SSG A.A.